You probably haven't heard of Detroit-Style Pepperoni Pizza, even though it's been around for nearly 70 years. 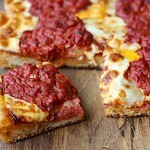 It was introduced to Detroit by Buddy's Pizza, a restaurant chain from the Detroit area. Legend has it that Detroit-style pizza was first baked in blue steel pans that were originally utility trays that held hardware and tools for assembling automobiles. 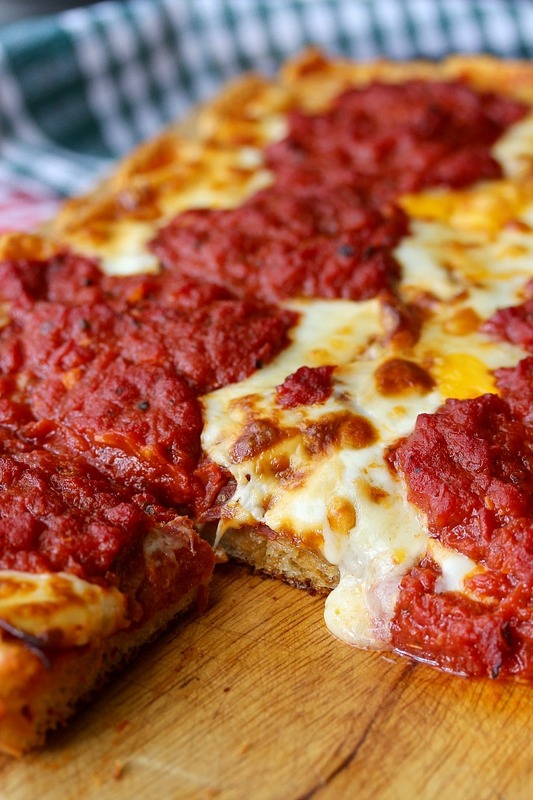 There are probably a lot of arguments about authentic Detroit-style pizza. For example, "do you add the sauce before baking or after?" Or... "Isn't this is really just Sicilian (or Grandma) pizza?" To answer the first question... I've tried it both ways, and will not step into the fray. This version calls for adding the sauce prior to baking. Here's a version that calls for adding the sauce after baking. To answer the second question... I have heard that the genesis of this pizza may have something to do with introducing Sicilian-style pizza to Detroit, but I can't be sure. Either way, I've got it on good authority (I know one person from Detroit) that this pizza, as it has evolved, is definitely Detroit. 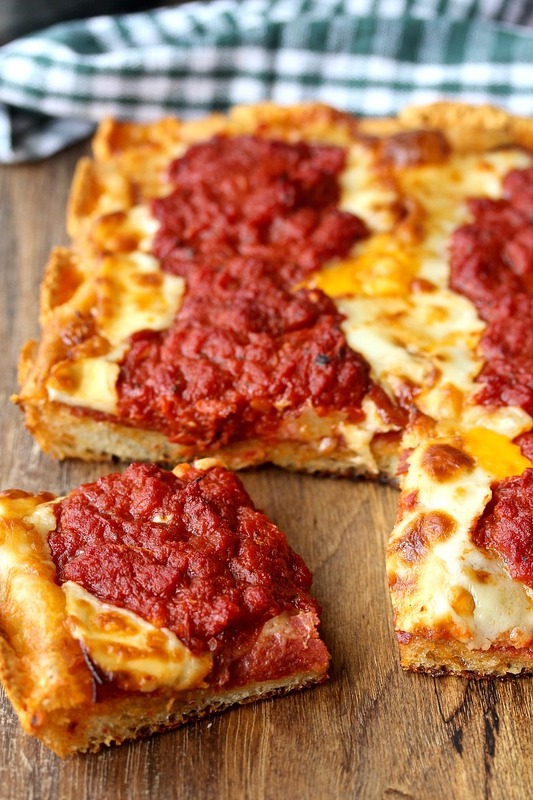 The original Detroit pizza is made with brick cheese. I have actually spotted it at a local grocery store, but in an extremely rare moment of ingredient hoarding restraint, I didn't buy it, and now can't remember which store it was! However, there are substitutions. In this recipe, I used a combination of low moisture mozzarella cheese and mild cheddar cheese, (some yellow and some white). I've also heard that you can use Monterey Jack. Whatever cheese you choose, Detroit-style pizza is distinguished by the crispy crust of caramelized cheese on the edges of the dough, so be sure to tuck some of the cheese along the edges of the pan. I baked this pizza in a 10 inch by 14 inch Detroit-style pizza pan. If you are not a baking equipment nut like me, you can use a 9 inch by 13 inch cake pan or a quarter sheet pan. 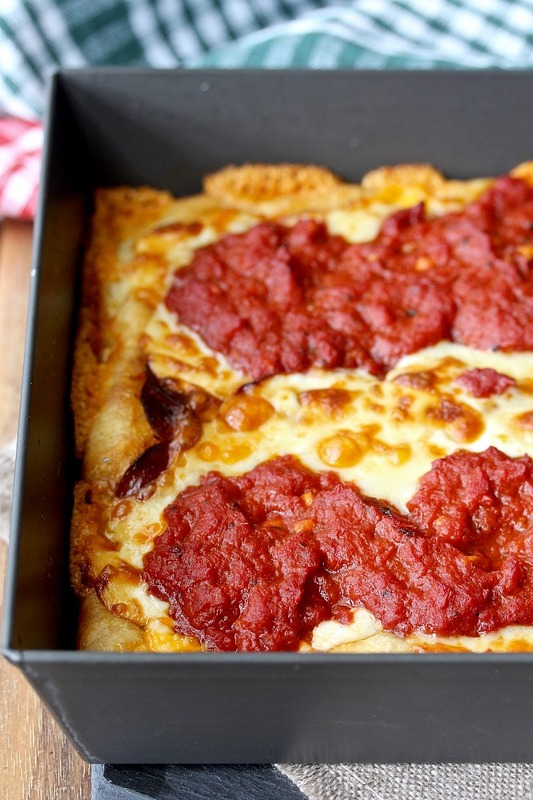 To make Detroit-style pizza, you also will need to make the crust with a very sticky dough. This crust is crispy, airy, and light. Don't be tempted to add more flour during the kneading process. The toppings for Detroit-style pizza are added in reverse order. First you add the pepperoni, then the cheese, and finally, you dollop on the sauce. This month, the Bread Bakers are baking flat breads with yeast or starter. Our host is Sonia from the blog Sonlicious. 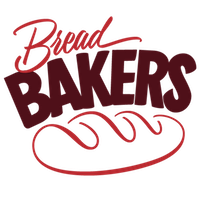 After the recipe, you will want to visit the links to some wonderful sounding breads. Mix all of the dough ingredients together in a stand mixer or by hand (warning: it's a sticky dough) on low speed until all of the flour is incorporated and the dough looks "shaggy." Cover the dough with plastic wrap and let rest for 10 minutes. Continue to knead the dough until it is smooth, about 8 minutes on the second speed. Scrape the dough into an oiled bowl or dough rising bucket, cover, and let rise until doubled, about 2 hours. While the dough is rising, heat the olive oil in a sauce pan over medium heat. Add the garlic and seasoning, and sauté for about 30 seconds, until fragrant. Stir in the tomatoes and the sugar. Bring to a simmer, and reduce the heat to medium low and cook for about 20 minutes, until the sauce is reduced to about 3 cups. Set aside. Add 2 tablespoons of olive oil into a 10 inch by 14 inch Detroit pizza pan or a 9 inch by 13 inch pan and spread it with a pastry brush or your fingers. Scrape the dough into the pan, and gently stretch and press the dough with your oiled fingertips to completely fit the pan. If it resists, cover it and let it rest for 20 minutes, and then try again. Repeat if necessary. Once the dough fills the entire bottom of the pan without shrinking back, cover and let rest for 30 to 45 minutes. Place an oven rack in the bottom position, and preheat your oven to 500 degrees F.
When the dough is ready, layer the pepperoni evenly over the dough. 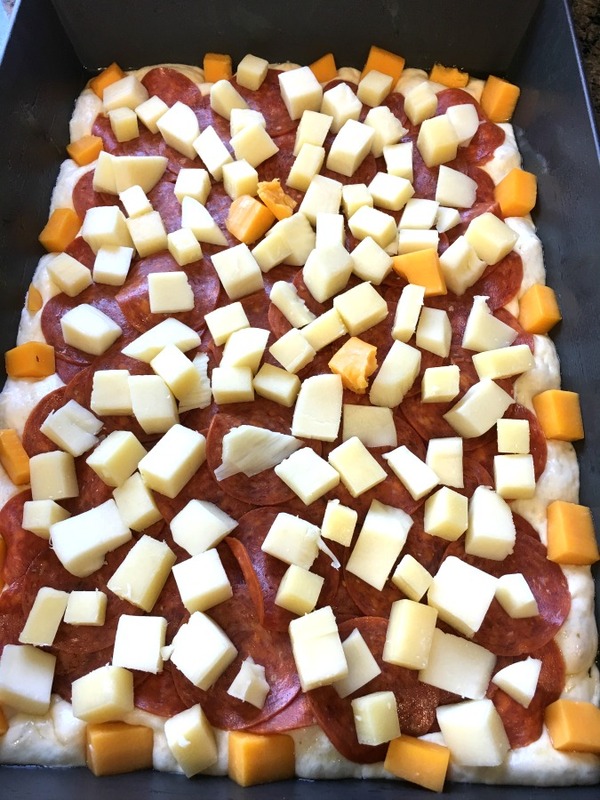 Distribute the cheese evenly over the pepperoni, making sure to place some of the cheese at the edges of the dough. Dollop the sauce over the cheese in six puddles or two to three stripes. I did two lengthwise stripes. Bake the pizza on the bottom rack for 15 to 20 minutes, until the cheese is bubbly and the edges are browned (even blackened is okay). Remove the pan from the oven, and run a spatula along the edges of the pan to separate the melted cheese from the pan. Let the pizza rest for 5 to 10 minutes. Using a flattop spatula, move the pizza to a cutting board, and slice and serve. Recipe adapted from King Arthur Flour, and inspired by Serious Eats. Some of the product links contained in this post are Amazon affiliate links. This means I earn a small commission in store credit to support my cookbook habit if you purchase a product I referred (at no extra charge to you). unfortunately pizza is the one item I'm having a horrible time with - braces and pizza make a very tricky pair. You poor thing! It will be over before you know it! 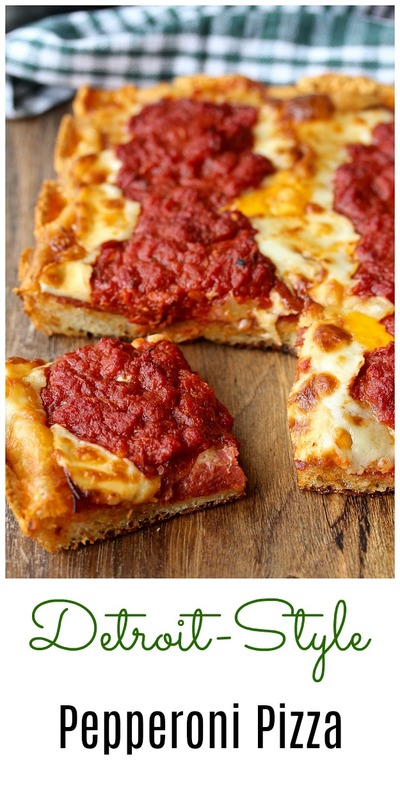 I have never heard of Detroit style pizza before but I so want to try it now. Looks really good Karen! Well now you know two people from Detroit and your recipe sounds perfect. We love Buddy's pizza and I can't wait to try it at home. Oh cool! Let me know if you do! Having the sauce on top is definitely worth trying! Ha ha! It's the best, isn't it! A tempting and delicious Pepperoni Pizza Karen!